Can libraries drive neighborhood improvement efforts? The idea that libraries can serve as anchors for neighborhood commercial corridors and downtown districts is not a new one. In our work, we often come across examples of libraries that are a critical piece of overall tenant mix. They serve as corridor destination drivers, spurring revitalization through activities and offerings that bring people to an area. A recently released study by the Local Initiative Support Corporation (LISC), in partnership with the Institute of Museum and Library Services, explores this concept further. The report considers library (and museum) efforts that have become catalysts for neighborhood revitalization, particularly in poor communities. 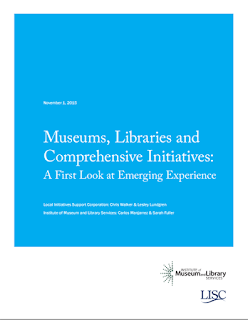 Entitled “Museums, Libraries and Comprehensive Initiatives: A First Look at Emerging Experiences”, the report identifies 50 examples of library and museum efforts aimed at improving the overall conditions of distressed communities. The economic impact of anchors like libraries should not be underestimated. In New Rochelle, the popular children’s storytime has become a place where parents and day care providers can gather with their children, which in turn spurs demand for lunch at the local coffee shop. It is a virtuous cycle that reinforces downtown as something much more than just a shopping destination. It reinforces the traditional role of downtown as a civic and cultural destination, which in turn drives patronage to local businesses. anchor in downtown New Rochelle, NY. In low-income communities, the library becomes even more important. It becomes a place to do more than borrow books. It is a place to overcome the digital divide, provide job training and workforce placement services, and to close the gap between information and resources that is so prevalent in lower income communities. In 2014, the Aspen Institute produced a report entitled “Rising to the Challenge: Re-Envisioning Public Libraries” that looked at the new role that libraries are playing in providing a social safety net for people in search of educational opportunities, jobs, health and government resources. And as people increasingly gather their information from the internet, providing internet access in communities where that access is limited is even more crucial to ensuring an even and equitable playing field for people of all incomes and backgrounds. Can your local libraries become an anchor for commercial revitalization efforts? Yes, but as the LISC reports notes, library efforts need to be tied explicitly tied to community revitalization efforts. Library leadership needs to be at the table participating in community planning efforts. In New Rochelle, the library is an active participant in the activities and programs sponsored by the Business Improvement District. “BID Family Days” take place on the Library Green from September to June and feature music, crafts, performances, films, entertainments and educational activities. The idea here is that libraries can serve as “leading” investments when private sector investment is not yet forthcoming. Improvements in physical infrastructure by public entities can help catalyze investment and change perceptions in a way that has a two fold impact. First, the community benefits tangibly from the availability of new resources, and second, the perception of the community can begin to shift in a way that signals opportunities for much needed investment. Eliminating blight, driving pedestrian traffic, supporting small business opportunities – these are all fundamental to corridor improvement efforts and are a tangible demonstration of the impact of community facilities on local business districts.